Baxter of California, one of the original men’s grooming brands created by Baxter Finley in 1965. Cutting edge for its time, it started with a single product: Super Shape, a men’s skin conditioner that offered protection from the sun and sea. This gender-specific breakthrough was no gimmick. Suddenly, guys got grooming. 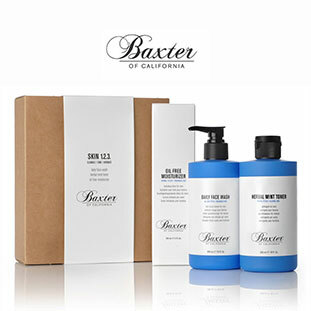 In the years since then, Baxter of California pioneered a comprehensive range of products tailored to a man’s needs. Years of research by our experts proved that all skin is not created equal. Our approach is science plus nature, built from the ground up in California. We may be old school in concept, but we’re high-tech in practice. Bottom line: Finley’s dry skin began a revolution. Baxter’s legacy meets advanced research: this is the evolution of men’s grooming.